What is renal vein thrombosis? Renal vein thrombosis is a blood clot that forms inside the blood vessel that empties blood out of the kidney. Unlike blockage of the artery that brings oxygen-rich blood to the kidney, a renal vein thrombosis is unlikely to cause permanent damage to the kidney or death of any portion of the tissue. However, it does impair kidney function that has a host of consequences. The greater danger is when the clot breaks away from the renal vein and reaches the lung where it causes an obstruction of the blood vessels (pulmonary embolism). Renal vein thrombosis usually does not present with any specific symptoms and may be found incidentally or should be investigated as a possibility with certain conditions that are known to cause it. A renal vein thrombosis is more likely to occur in the backdrop of nephrotic syndrome in adults and dehydration in infants. It is estimated to affect between 5% to 60% of patients with nephrotic syndrome. Men are twice as more likely to suffer with renal vein thrombosis than women. Since conditions that lead to nephrotic syndrome are more common in later life, a renal vein thrombosis is more likely to arise in the 40 to 60 year age group. Blood flow to and away from the kidney is through the renal artery and renal vein respectively. The artery carries oxygen rich blood to the kidney. This blood not only nourishes the kidney tissue but is also filtered so that wastes can be removed from the bloodstream. The blood eventually drains into the renal vein and sent to the right side of the heart. 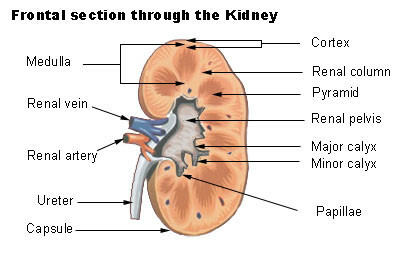 Picture of the kidney from Wikimedia Commons. All these factors can contribute to the formation of a blood clot (thrombosis) in the renal vein. Trauma can injure the blood vessel as well as various diseases. Disruptions is blood flow may arise with a tumor in the vein. Different conditions like dehydration and nephrotic syndrome can alter the coagulability of blood meaning that the chances of a clot forming are greater. A blood clot in the renal vein impairs the outflow of blood from the kidney. This is blood that is low in oxygen and needs to drain into the inferior vena cava. From here it is transported to the right side of the heart, sent to the lungs for re-oxygenation and circulated again. Blood can back up in the kidney since its drainage is partially or completely obstructed. This causes stasis of blood and increases the possibility of further clots forming. It can ultimately impact on kidney function and lead to renal failure. Injury to the abdomen or back can also contribute to renal vein thrombosis. This includes blunt force impact (like a punch or blow) and sharp penetrating injuries. The use of oral contraceptives and steroids can also cause the formation of a blood clot in the renal vein. An abdominal aortic aneurysm (AAA) can compress the vein and affect the flow of blood thereby contributing to renal vein thrombosis. Enlarged lymph nodes and scar tissue around the renal vein may also cause compression. Clotting disorders such as antithrombin III deficiency may impact on the coagulatibility of blood therefore predisposing to clot formation. The coagulability is also affected by pregnancy and other high estrogen states usually caused by oral contraceptives. In renal cancer, the cancer cells can spread to the vein thereby triggering formation of a blood clot in the renal vein. This is known as a tumor thrombus. The symptoms of a renal vein thrombosis are not usually evident. However, the symptoms of the causative condition or complications are more likely to be evident. Flank pain and hematuria (blood in the urine) are the major symptoms that appear when there is a sudden and severe blockage of the renal vein. Blood in the urine (hematuria) and unintentional weight loss over time. Renal vein thrombosis is diagnosed by imaging studies. This allows the doctor to visualize the clot or the disruption in blood flow. The symptoms alone are insufficient to diagnose the condition but may raise the suspicion of renal vein thrombosis. Blood tests are useful for monitoring causative conditions like nephrotic syndrome or coagulation disorders. Imaging studies such as intravenous pyelogram (IVP) and plain x-ray may note structural changes as a consequence of renal vein thrombosis. However, other imaging studies are necessary for a conclusive diagnosis. A special contrast dye is delivered into the veins and the blood can be visualized on an x-ray thereby indicating any narrowing. A contrast dye which is visible on x-ray is injected into the renal artery which is useful in some causes of renal vein thrombosis where the kidney artery is also involved. High frequency sound waves (ultrasound waves) are used to visualize the kidney and veins and assess the blood flow. However, it is usually not sufficient for a definitive diagnosis. A CT scan takes x-rays from different angles to create cross-sectional images of the body. X-rays pass through most tissues except bones and therefore a contrast dye may be needed to highlight the renal vein. An MRI uses radio waves and magnetic fields to form images of organs and different parts of the body. Both investigations may be useful for diagnosing renal vein thrombosis. Depending on the size of the clot and degree of obstruction, as well as pre-existing kidney disease, a renal vein thrombosis may lead to kidney failure. 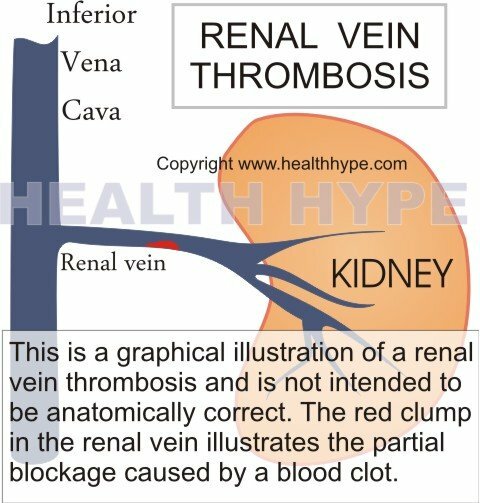 Should the clot dislodge from the renal vein, it will pass into the inferior vena cava, through the right side of the heart and obstruct the pulmonary blood vessels (lungs). This can affect the flow of blood to the lungs where carbon dioxide would be passed out and oxygen received. This is known as a pulmonary embolism and is potentially fatal. Treatment should be targeted at the underlying cause and the clot may eventually dissolve on its own. However, various measures may need to be taken to prevent the clot from breaking off or new clots from forming. Nephrotic syndrome needs to be treated accordingly depending on the cause. This may include drugs such as corticosteroids and immune suppressants. Other medication, like ACE inhibitors, to treat the symptoms of nephrotic syndrome also reduces the increased coagulablity of blood. Cancer often needs to be treated surgically where the affected portion of the kidney and vein has to be removed. Failure to do so could lead to the cancer spreading to other parts of the body (metastasis). Anti-clotting agents are used to prevent new clots from forming. Warfarin is one such drug and is intended to prevent a blood clot from lodging in the lungs – pulmonary embolism – which can be fatal. Dialysis is a temporary measure to help filter out wastes from the blood in the event of acute renal failure. It can be stopped once the normal kidney function returns. Surgery is usually not conducted unless renal vein thrombosis is due to cancer or both renal veins have clots within it. Sometimes a filter is placed in the inferior vena cava to trap any blood clots that break away from the renal vein thereby preventing it from lodging in the lungs. However, anticoagulants are usually sufficient for this purpose.